This nightcap is so nice and stretchy that we can wear it pretty much all the time, during day and night. Our sleep hats keeps head warm without overheating, and you can pull it down to cover eyes to block light, if needed. Cotton hats keeps the heat from escaping your head without being bulky or getting sweaty. The sides of sleep cap can be folded up and down, it is allowing to adjust the length of the hat as you want. If there is any question with our night cap, please contact us, you have 30 days free exchange. We will promise and take full responsibility to solve your problem quickly and efficiently! High quality - WDSKY sleeping cap is made of extremely soft cotton and very well craft. The material is very soft and the right thickness. All seams are sturdy and no chance of fraying. Our mens hats design allows the cap to fit ones head without worries of being tight or loose. It provides breathable warmth, too. Comfortable - Our nightcap is soft, easy stretch and comfortable. Double fabric makes it warm but not too hot to wear at night. It fits well enough to wear while sleeping and you do not worry about it coming off while you are asleep and trying to find it the next morning. It is breathable and great for sensitive skin. Great for Sleeping - The hats is great for sleeping. 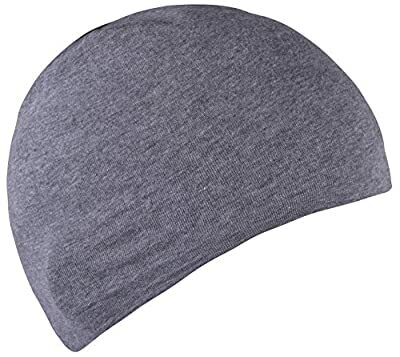 It is lightweight and helps keep you warm without head getting too hot and sweating. You can wear it to keep head at a comfortable temperature. Wear this cap you will very easy to sleep in at night. Useful - This sleep cap fits well. The sides can be folded up to wear around the house or outside. Roll the sides down to cover you eyes and ears on those cold days when take a nap. It keeps head warmer and can be used to block light from eyes. It is work great for sleeping and are perfect for weather that is not too cold outside. 100% Satisfaction Guaranteed - If there is any question with our product, please contact us. We will do our best to meet your request and solve your problem quickly and efficiently! We must give you a satisfied answer.